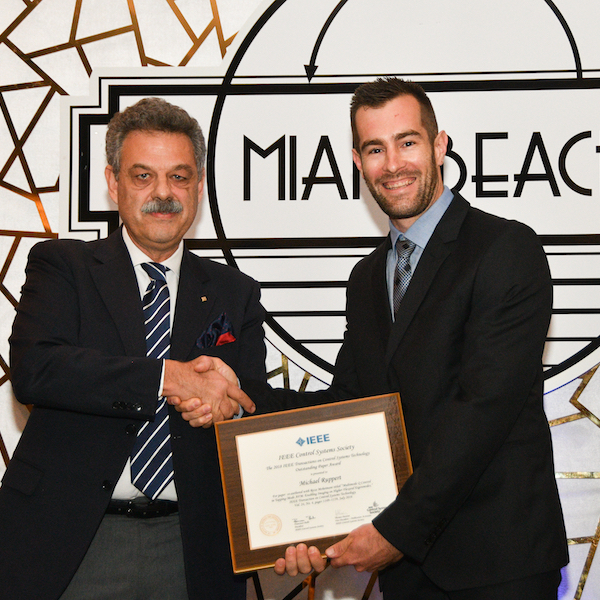 Dr Michael Ruppert, a research associate in the School of Electrical Engineering and Computing, attended the IEEE Control Systems Society Awards Ceremony at the 2018 IEEE Conference on Decision and Control in Miami, Florida, on December 18, 2018, to accept the outstanding paper award from the journal IEEE Transactions on Control Systems Technology. This journal is widely accepted as the premier scientific journal in control engineering, the award is given to the paper based on originality, relevance of the application, clarity of exposition, and demonstrated impact on control systems technology. The paper titled “Multimode Q Control in Tapping-Mode AFM: Enabling Imaging on Higher Flexural Eigenmodes”, was co-authored with Conjoint Professor Reza Moheimani. The research is on multi-frequency atomic force microscopy (MF-AFM). Compared to conventional AFM, where a microcantilever is used to create 3D images of samples at resolutions hundreds of times beyond what is possible with optical microscopes, MF-AFM also has the capability to extract the nanomechanical composition of a sample by exciting and detecting additional vibrational modes of the cantilever. The ability to control these modes and their responses to excitation is believed to be the key to unraveling the true potential of these methods. "ln this paper, we proposed a robust feedback controller that enables arbitrary control of microcantilever quality factors. This enabled us to improve imaging stability and achieve higher cantilever bandwidth while imaging nanometer features," Dr Ruppert.